MASTER PROBLEMS Health and Wellbeing Why consider making rocking chair your favorite chair? Why consider making rocking chair your favorite chair? What is better than sitting in a comfortable chair after being on your feet all day? And if that chair happens to be a rocking chair, well, that is comfort in motion. Why the great popularity of the rocker? Why do many consider it one of the more comfortable and useful chairs? Well, for hundreds of years this chair has been used by mothers to lull to sleep their little ones or stop their tears. And many a mother has felt that at the same time it quieted her nerves! There just seems to be something about the motion that brings a feeling of security to the wee ones. Many older ones also find the gently swinging motion of a rocker a soothing balm for the aches and pains of age. They have found that after being too nervous to sleep, a few minutes of rocking really calmed them so they felt sleepy. Rocking on the porch on a quiet evening has given them a chance to meditate—to put things into perspective. Some older folks feel that one problem of the younger generation is that it does not know how to relax. So perhaps the growing popularity of the rocking chair in some places indicates a yearning by the young for a little “old-fashioned” serenity. Besides the emotional benefits, however, there are many practical benefits to the rocker. In the tropics, the back-and-forth motion serves much like a fan and also discourages the mosquitoes from making a landing. A great incentive to stay in motion! Too, in hot climates three or four persons sitting on an overstuffed sofa would soon become uncomfortably warm. But with a rocker each one is in his own individual chair with air circulating around him. For this reason, a typical living room in some tropical areas will have several rockers. These often face one another with a matching round table in the center. This allows each guest air and his own rocking speed! Another factor contributing to the popularity and reputation for comfort of this chair is the wide variety in size and shape. There are rocking chairs made of wrought iron and steel for use out-of-doors. There are simple wooden rockers for covered porches and there are elaborate overstuffed rockers. A longtime favorite style with many people is the “Boston” rocker. Who designed the first rocker? Who first put a chair ‘in motion’? While the cradle, a small rocking bed, has been in use for many centuries, apparently the rocking chair is a more recent invention. 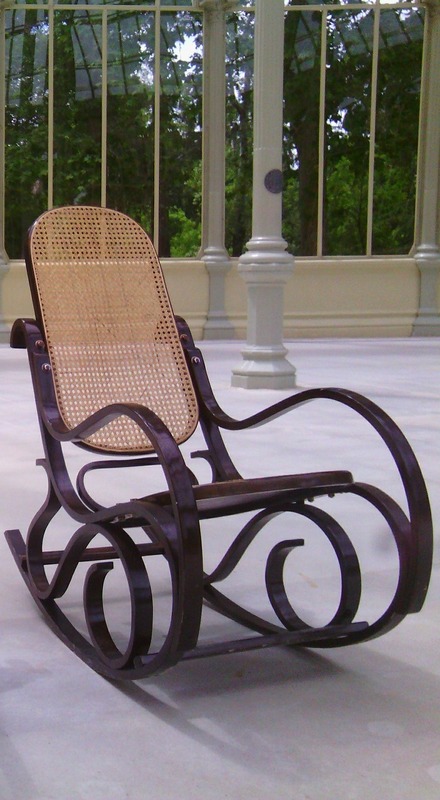 Many say the first rocking chairs were made in the seventeen hundreds in what is now the United States. So, of course, the inventor’s identity is also disputed. It is, however, generally agreed that the first rockers were made by shortening the legs on an older chair. Then it was fitted with “bends” or “runners” on the bottom, thus allowing it to sway back and forth. In the United States many persons who love antique furniture have a special fondness for rockers. Some have bought an old, painted rocker (perhaps deserted on a porch or in a barn for many years), stripped off the old paint and found good oak wood underneath, just waiting to be restored. They feel that the ‘creaks and groans’ of an old rocker are the “music” of another age and so would not trade their old rocker for a new one. Although it has much to recommend it, there is one danger with many rocking chairs. Young ones or pets can sometimes crawl underneath one of the rocker’s “feet” and thus get pinched against the floor. It is strongly suspicioned that if cats could talk, many a feline with a bruised tail would not vote the rocker her favorite chair. She may have strong feelings about it, in fact. Not so with people, however. While the reasons for the popularity of the rocking chair differ from place to place, one conclusion becomes more obvious. Growing numbers of people are making their favorite chair a rocker. They agree that a rocking chair is comfort in motion!